The Dentsu Group is Japan's largest advertising and communications group. By applying its unique “integrated communication design” method, it provides its clients all over the world with comprehensive and excellent advertisements and marketing services. While ceaselessly pursuing digital innovations, it continues paying attention to the entire global sports and entertainment market. Founded in 1901, the Dentsu Group is the world’s largest advertising agency and the fifth largest marketing and communications organization. It developed from the Japan Advertising Ltd. established in 1901 and Japan Telegraphic Service Co. established in 1907. In 1955, the company name was changed into Dentsu Inc. DENTSU INC. maintains the top share in the Japanese advertising market, which accounts for 10.0% of the global market. In terms of net sales, Dentsu is the No.1 advertising company in the domestic market. The reason for Dentsu’s dominance is twofold: The Company has a diverse client portfolio and enjoys solid buying power in all major mass media formats. Dentsu handles the advertising campaigns of many blue-chip companies, and major global clients have chosen the Company to act as a partner in the Japanese market. Such connections underpin a well-balanced client portfolio. Dentsu Group is ranked fifth globally. From a geographical perspective, the Dentsu Group holds formidable market share in the Asia-Pacific region and also in Western Europe, while in North America, the largest ad market in the world, there is still plenty of growth potential. Dentsu Inc.officially entered China in May 1994 and established Beijing Dentsu Advertising Co., Ltd., as a joint venture with China International Advertising Corporation and Dacheng Advertising Company. 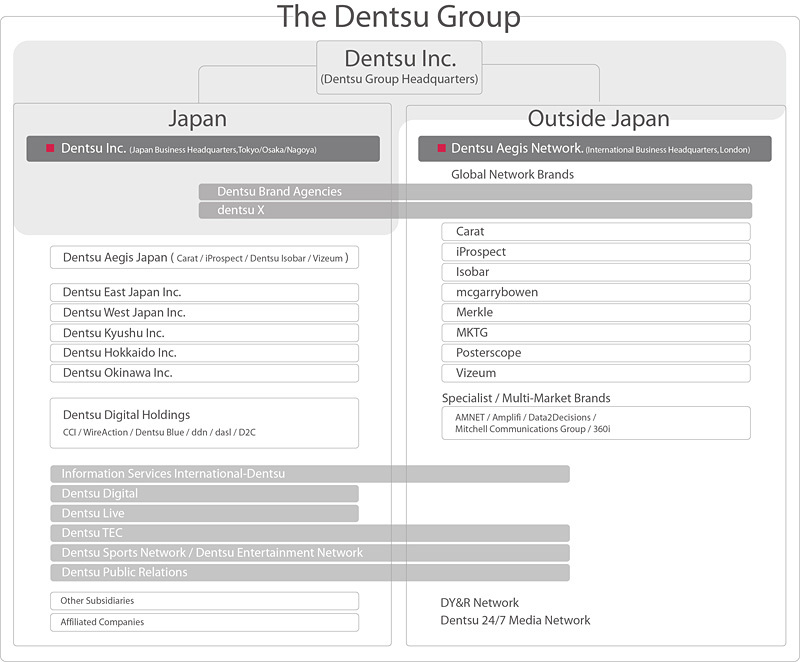 Dentsu's business can be found in the whole world. It endeavors to strengthen its relationship with the overseas companies and emphasizes on providing clients with professional and high-quality services. In March, 2013, it acquired the Aegis Group plc and established the London-based Dentsu Aegis Network, which is a new global operations organization managing Dentsu's global business operations outside Japan, to boost its global strategies and the capability for trans-regional cooperation. The enlarged Dentsu Group has started its business in over 140 countries and regions, and employed over 55,843 professionals. It will make unremitting efforts to improve its services for its clients and build a more competitive global network.